Listen to our music and come up with your own description. Here are a few samples of our music. Listen here to The Texas Gypsies version of "I Will Survive"
Imagine this: you’re in a quaint Parisian café listening to a delightful acoustic jazz combo. The air is filled with songs, some familiar, some exotic and intriguing. You’re caught up in the music as lightning-fast guitar runs dart in and out of beautiful violin melodies. The rhythm guitarist is strumming his guitar with fiery abandon while the bassist slaps a rhythm that your feet can’t resist. With your partner, you stand and move to the dance floor. Suddenly you stumble and trip over a Shiner beer bottle. As if waking from a dream, you realize that this isn’t Paris, France—it’s Paris, Texas! The jazz combo isn’t just playing the music of Django Reinhardt and Stephane Grapelli, they’re also playing songs once made popular by Bob Wills and His Texas Playboys. Is this some crazy dream, or perhaps some bizarre parallel universe? Of course not. You’ve just entered the world of the Texas Gypsies. 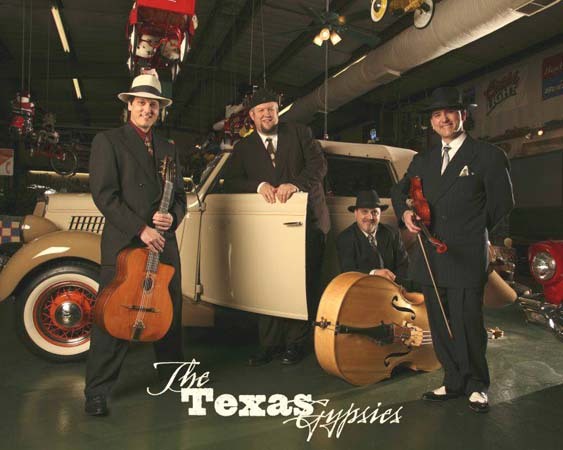 Bringing together members of Cowboys & Indians and the Light Crust Doughboys, the Texas Gypsies is a 4-piece acoustic combo that combines gypsy jazz with western swing along with our own compositions. We feature two guitars, violin and bass. Our music is at once earthy and sophisticated, appealing to a wide audience. This isn’t music for jazz purists. This music makes you feel alive. 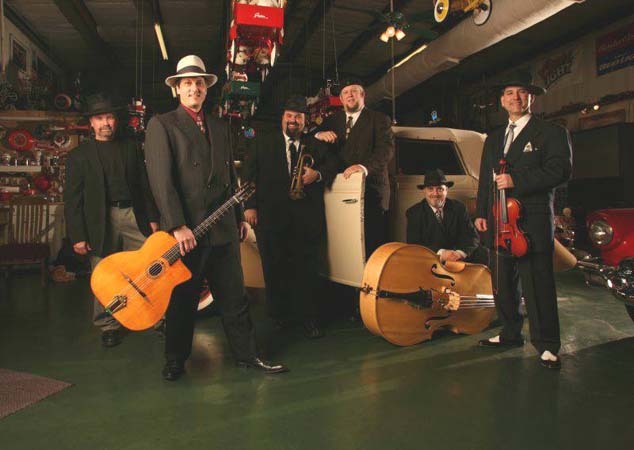 Catch a Texas Gypsies show and see what we mean by Acoustic Swing—Texas-Style.